This isn't just the story of my incredibly cute Christmas decorations. It is also the story of how dangerous hot glue guns can be. And it’s the story of how I learned my family thinks I am a walking disaster. Here’s the bottom line, do NOT use a high heat glue gun with low heat glue sticks (which are apparently a thing). The glue will come out too fast and spill all over your hand and before you know it, your skin is blistering under the glue and you can’t peel the glue off or the blisters will open and you realize you really are a walking disaster. 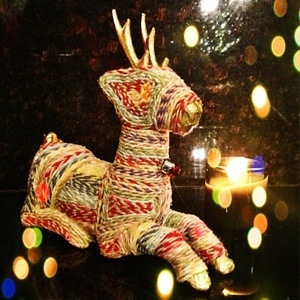 I first saw these reindeer on Olive & Cocoa and fell in love. Until I saw that they were going for $200 dollars, which so wasn’t happening. Then Honestly... WTF? did a DIY version of these adorable critters. But for some strange reason that my ego can’t comprehend, nobody pays me for blogging (totally open to that though...) and I am trying to save money, I didn’t want to spend money buying fabric like the Honestly...WTF? version used. Instead I searched Michael’s ran around Michael’s on a crafting high until I found a cheaper way to get a similar result. 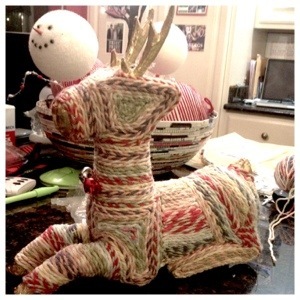 Glue the beginning of the two strings of yarn onto the reindeer. I started at the nose and moved my way down the back of the neck, to the chest of the animal. Use your glue gun to guide where the yarn should go. You want to twist the two types of yarn together to add more color, and make sure you aren’t wrapping the animal in the same direction the whole time. Mixing it up will make it a lot more interesting. This process takes a long time, but you don’t have to do it all in one sitting. Once the animal is wrapped, tie a little necklace with bells around the reindeer’s neck and admire your handiwork.